You add a water fountain to your home for the tranquility and beauty. It's like you have your own brook or mini waterfall in your outdoor living space or inside your home. But a fountain that's too loud or a fountain pump that makes more noise than the water can ruin the mood. Cleaning, adjusting or replacing the pump, tubes or other decorative water fountain parts can usually fix the problem. Before you start taking things apart, check the fountain's water level. A low water level can make the fountain louder than normal because of the excess air into the pump. And it can cause the pump to burn out. Keep the water level at least 1/2 inch above the top of the fountain pump's housing to keep it quiet and prevent damage to the pump. If more water doesn't fix the noise issue, try cleaning the various parts of the fountain. For safety, always unplug the pump before adjusting the pump's flow rate or maintaining your fountain. Dry your hands before unplugging the fountain pump to avoid the risk of electrical shock. Keep the fountain pump cord away from walkways to avoid a tripping hazard. Unplug the fountain pump and remove it from the fountain. If the fountain pump isn't visible, remove the decoration that's hiding it. Fountain designers often hide the pump under a decorative feature such as a slate platform or piece of bamboo. Gently lift the decorative item out of the fountain to expose the pump, then remove the pump. Remove the fountainhead or tube from the pump if it has one. A fountainhead or tube is an attachment that directs the flow of water. Grasp the base of the fountainhead directly above the pump and gently pull it out. Rinse the fountain pump and fountainhead under running water. You can also immerse the pump and the tube or fountainhead in undiluted vinegar to remove mineral deposits. Keep the power cord out of the bucket. Leave the fountain parts to soak overnight. Flush the fountain pump and fountainhead under running water to remove any remaining debris. The vinegar dissolves mineral deposits that can build up in a fountain pump and affect its operation. Clean the fountain once a month to maintain your pump and reduce mineral buildup. Add 1 tbsp. of vinegar per gallon of water to your fountain to reduce the risk of mineral buildup. Sometimes washing the decorative parts of the fountain can help. Wash the fountain basin and any rocks or decorative parts with water and mild soap such as dish soap. Remove any materials that show signs of deterioration. If sandstone, shells, driftwood or other materials deteriorate, the debris can damage the pump. Rinse the fountain basin and decorative parts. Reassemble the fountain. If the fountain pump has suction cups, pour 1/4 inch of water into the basin and press down on the fountain pump to engage the suction cups. Securing the pump reduces vibration and noise, which can help you have a quiet water fountain. Replace the fountain's decorative features. Adjusting the water flow through the pump can help with the sound issue. Check the fountain pump for a flow-rate switch. It's usually located on the side of the pump and often indicates "S" for slow and "F" for fast. Move the switch to the "S" position. A slow rate of water flow makes the fountain quieter. Not all fountain pumps have adjustable flow rates. Ensure that the fountain pump isn't touching the sides of the basin unless it's designed to do so. A pump vibrating against the fountain basin causes excess noise. If the fountain still makes too much noise, it might be time to start shopping for a new pump. Retailers such as pond stores and garden centers carry submersible outdoor and indoor water fountain pumps designed for quiet operation. A submersible pump is a pump designed to operate safely underwater. A fountain that's less than 18 inches across requires only a small water pump, one designed to pump less than 100 gallons an hour. If your fountain has a larger, more powerful pump, replacing it with a smaller one will reduce the noise. If you replace your fountain pump, choose one with an adjustable flow rate. 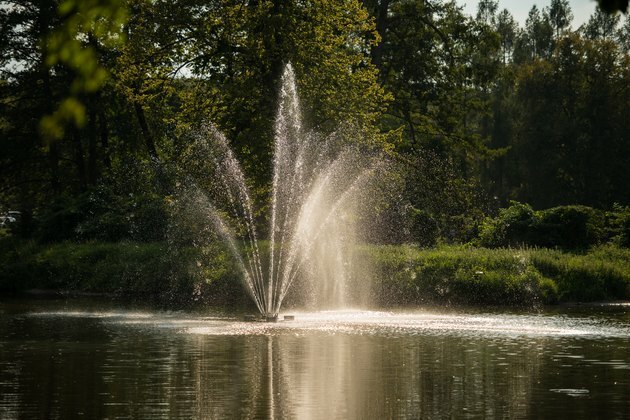 A little maintenance can improve the sound of everything from inexpensive wall fountains to massive outdoor fountains. Those simple changes can return your fountain to the quiet, peaceful trickling water feature you want.